Got a piggy bank for Faith during Christmas. Makes me wonder who was the genius responsible for naming the product? the japanese phrase doesn't quite make much sense either..."You look at me, but, I'm so cute!!!"?!?!! cute :) hope she has a fat pig soon! Pam: If it doesn't make sense, I wonder why they even bother to print it? Perhaps with English and Japanese printed on it, the product will appear more "high class"? Spinnee: Reminds me of my school days when Japanese stationeries were popular back then and the tag lines on them also make people catch no ball. i heard the japs did it purposely to give their products more personality and to up the cute factor. They sure burn themselves in your mind, no? Akk: Cute factor??? It is exactly this nonsensical writings that would convince me NOT to buy it. 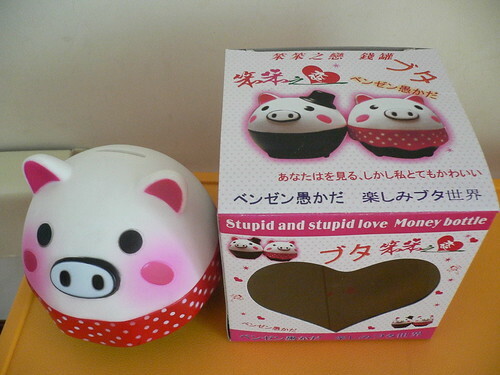 but but... in the end, you still bought that really cute pig money bank! The pig like you ma... so cute right!!! Aloe: Not I buy one hor. Wife buy one. another tagline on the box says: pig stupid stupid in love very cute leh! Jojo: Harlow Jojo! My guess is that wifey bought this in Ch1na at the Walmart behind our place.